YEREVAN, Armenia – The American University of Armenia (AUA) celebrated International Education Week (IEW) for the first time on November 11-15, 2013. Throughout the week, AUA’s Center for Student Success organized a series of events and activities aimed at celebrating world regions and cultures, raising awareness of international and global issues, developing cross-cultural skills, and promoting respect and concern for other cultures and peoples. A series of movie screenings were organized each night in AUA’s Alex and Marie Manoogian Hall, followed by briefings and discussions. The lineup of films included: “Crossing Borders”, “Schooling the World”, “Girl Rising”, “The Insider”, and “China Blue”. Members from the faculty were also involved in a few of these movie screenings. In collaboration with the MA TEFL program, Dr. Rai Farrelly introduced the film “Girl Rising” with some factual information and a brief overview about the importance of girls’ education. Following the film, Dr. Farrelly led a discussion about some of the issues presented in the movie. 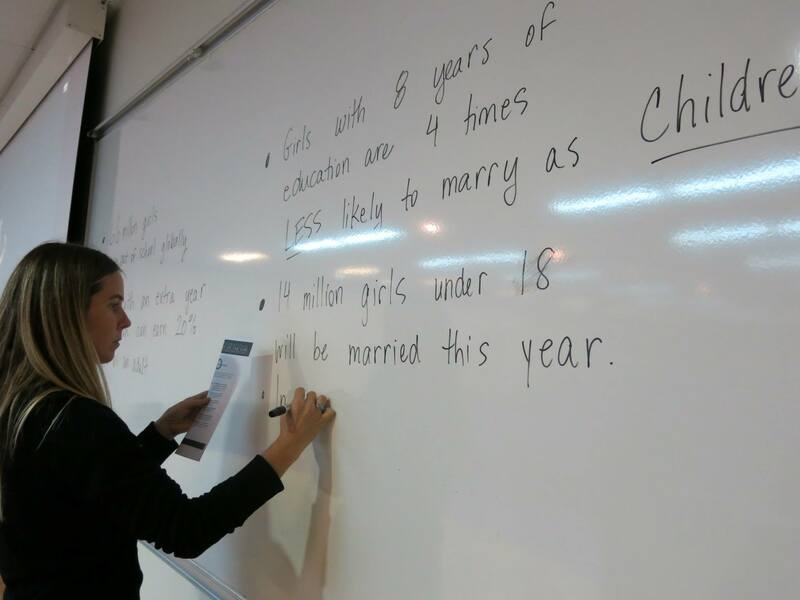 During the discussion, the participants also reflected upon how girls’ education is perceived in Armenia in comparison to the examples seen in the film. In addition to the MA TEFL program, International Education Week also included a collaborated event with the School of Public Health on tobacco control. Dr. Narine Movsisyan, Senior Researcher at the Center for Health Services Research and Development, provided introductory remarks for a film screening of “The Insider”. Dr. Movsisyan has been involved in tobacco control research and advocacy work in Armenia since 2003 and authored a number of peer-reviewed publications. “As you will see later in this film, when doing research, one may experience a conflict of interest about the responsibility of disclosing the truth for the common good.” Dr. Movsisyan’s work has been recognized by several prestigious awards, including the William Fulbright Scholarship. The week of celebrations also included an International Photo Contest. Students submitted photos that reflected the concept of international or global ideas. The photographs were held on display in the Center for Student Success lounge for voting. The winner of the contest will be announced on the Center’s website. International experiences were also displayed as AUA students and faculty gave short presentations about the countries they came from or had spent significant amounts of time in. AUA students Vardan Grigoryan and Anush Muradyan presented Georgia’s educational system and their experiences in Georgian schools. 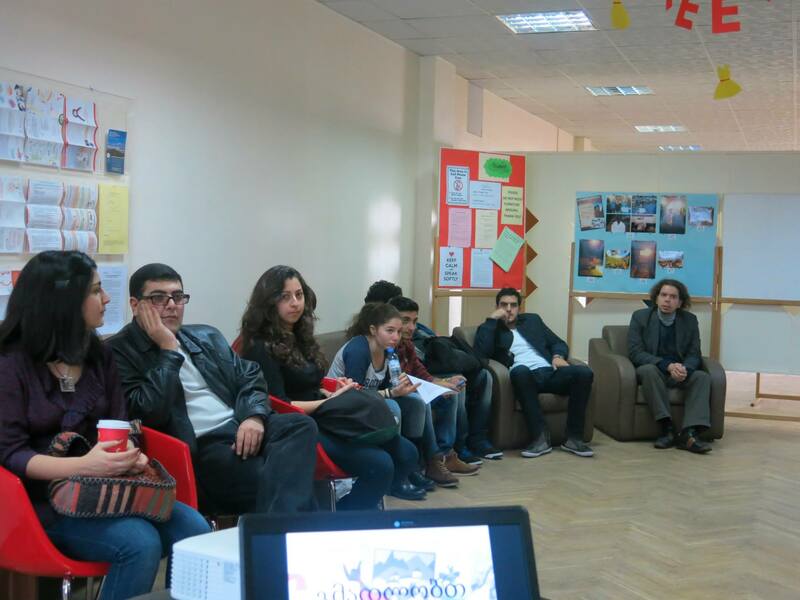 They also shared their experiences as Armenian minorities in Javakhk and why they decided to later come to the American University of Armenia. In addition to AUA students, Hilda Grigorian, a faculty in the MBA program, presented a country presentation on Afghanistan and illustrated the beauty of the country and the progress that has been made so far in rebuilding the country. Ms. Grigorian shared some of her experiences working with US and NATO armed forces and traveling in Afghanistan. Based on the mainstream media, Ms. Grigorian demonstrated the positive aspect of the country to the AUA community in order to engage in a different dialogue about Afghanistan. 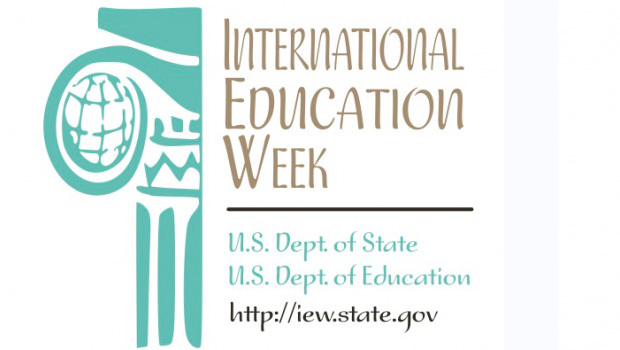 IEW first began in 2000 in the United States as a joint initiative of the U.S. Department of State and the U.S. Department of Education to promote programs that prepare Americans for a global environment and attract future leaders from abroad to study, learn, and exchange experiences. Today it is celebrated in more than 100 countries worldwide. MA TEFL Instructor Rai Farrelly led a discussion in conjunction with the screening of the documentary film Girl Rising as part of International Education Week. 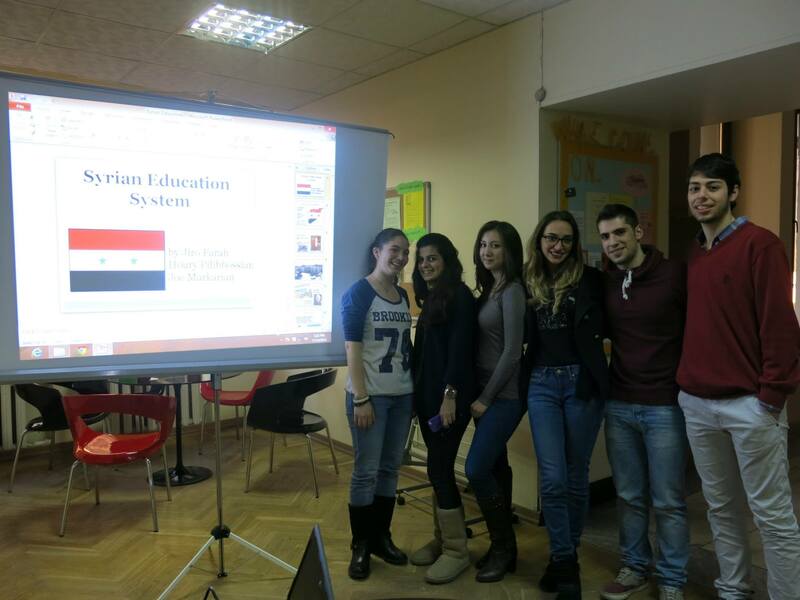 International students from Syria gave a presentation about the Syrian educational system. 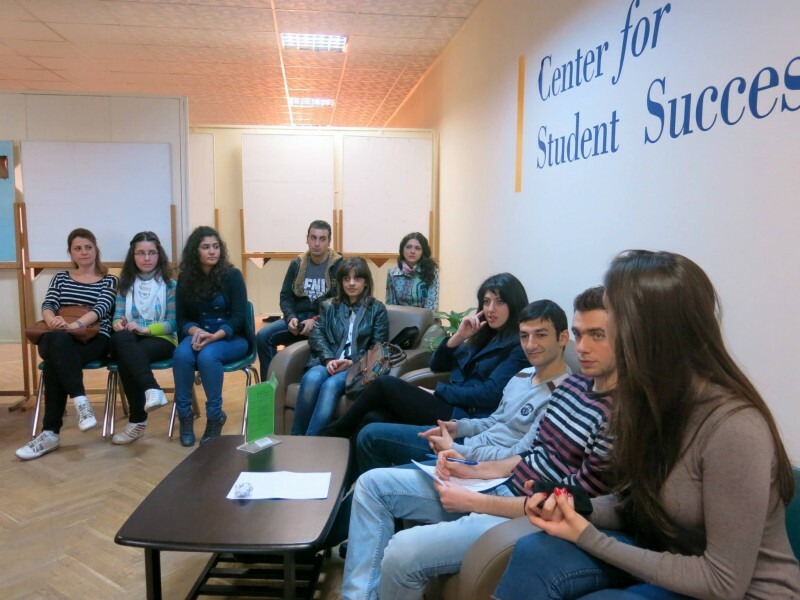 Students in AUA’s Center for Student Success listening to their classmates’ presentation on Syria. 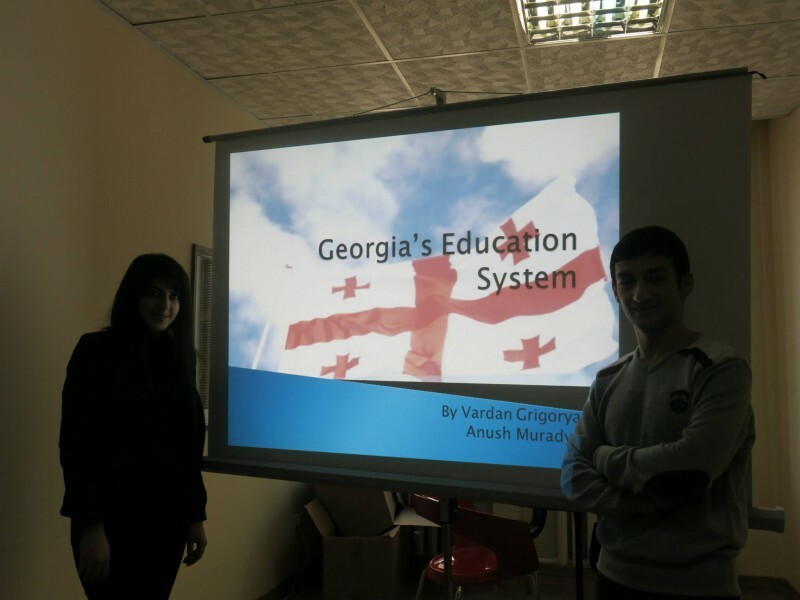 International students from Georgia gave a presentation about the Georgian educational system as part of International Education Week. AUA Students, faculty, and staff members attended Country Presentations in AUA’s Center for Student Success. AUA faculty member Hilda Grigorian gave a country presentation on Afghanistan, where she lived and worked for eight years.